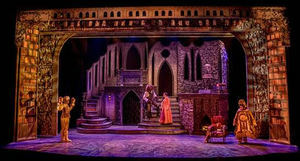 Disney’s Beauty and the Beast at White Plains Performing Arts Center Final Two Weeks! Be Our Guest for this Timeless Tale of Wonder and Love! Step into the enchanted world of Broadway's modern classic Disney’s Beauty and the Beast as the White Plains Performing Arts Center (WPPAC) proudly presents its dazzling holiday production onstage now until January 13, 2019. A timeless family favorite, Disney’s Beauty and the Beasttells the story of Belle, a young woman in a provincial town, and the Beast, who is a young prince trapped under the spell of an enchantress. Now a hideous beast, the prince must learn to love and earn their love in return, before the last petal of an Enchanted Rose falls. Should he fail, he would be doomed to remain a beast for all time. All of the fanciful characters, such as Cogsworth, Lumiere and Mrs. Potts are also trapped in this spellbound form until the Beast can learn to love and have his love returned. The cast includes Shaunice Alexander (Ensemble), David M. Beris (Maurice), Elizabeth Brady (Babette), Robbie Crandall (Chip), Brendan Doyle (Cogsworth), Katie Jo Flanagan (Ensemble), Michael Hardenberg (Ensemble), Apryl Higgins (Ensemble), Katelyn Lauria (Madame de la Grande Bouche), Paulette Oliva (Mrs. Potts), Robert Peterpaul (Lefou), Patrick Pevehouse (Lumiere), Taylor Rivera (Ensemble), Kristen Seggio (Ensemble), Tori Sicklick (Ensemble), Daniella Tamasi (Ensemble), Raleigh Tyler (Ensemble), Julius Williams (Ensemble), Adam Winer (Ensemble) with Tom DeMichele (Gaston), Ezekiel Andrew (Beast) and Erica Lustig as Belle. Disney’s Beauty and the Beast is Directed by Frank Portanova with Musical Direction by Stephen Ferri and Choreography by Lexie Fennell Frare. Scenic Design by Christopher & Justin Swader, Lighting Design by Jamie Roderick, Wardrobe Supervision by Samantha Irons, Sound Design by Robert McGarrity, Stage Managed by Jessie Jardon and Megan E. Coutts. Music by Alan Menken, Lyrics by Howard Ashman & Tim Rice, Book by Linda Woolverton. White Plains Performing Arts Center’s production of Disney’s Beauty and the Beast is the largest and most elaborate in the 15 years history of this regional theatre. You are invited to “Be Our Guest” for this mesmerizing experience that embodies that magic of the theatre. Disney’s Beauty and the Beast will play the White Plains Performing Arts Center Thursday, January 3 2pm; Friday, January 4 7pm; Saturday, January 5 2PM & 7pm; Sunday, January 6 2pm; Wednesday, January 9 11am; Friday, January 11 7pm; Saturday, January 12 7pm; Sunday, January 13 2pm. Disney’s Beauty and the Beast is a WPPAC Mainstage Production which is a professional production featuring union and non-union actors from Broadway, national tours and regional theatre across the country. These productions are created from scratch, staffed with professional production teams (directors to designers), large LIVE orchestras and boast high-quality sets and costumes.